Finally ready to hit the track the Pluma has seen a bit of refinement to make it rideable. That meant cutting the standard chain drivetrain into the cowl, as well as dividing the fairing into two pieces that come together over the rear wheel allowing for tensioning of the chain and removal of the wheel. The front end also gets updated a bit with a slightly more standard stem arrangement to provide more adjustability of fit, and a conventional steerer tube/fork design. Teixeira had claimed from the original concept that as a side benefit of the rear wheel cowl design, most of the moving parts of the bike became enclosed, protecting riders from the motion of the drivetrain in the event of a crash in the bunch. In the end the Pluma is constructed of a carbon fiber sandwich over top of a PVC foam core. It gets propelled by a Rotor 3D crankset with a 51 x 15 gear ratio. Even though it is enclosed, the bike still uses a disc rear wheel to minimize turbulence inside of the fairing. Wheels then are a PRO track carbon disc out back and a PRO 5-spoke carbon track wheel up front, both wrapped in Continental Tempo II track tubulars. The bike uses a conventional 31.8 stem wrapped in a custom fairing to clamp the 3T Scatto LTD track sprinter’s bar. The remainder of contact points are finished with a Selle Italia Flite saddle and a set of Speedplay Zero pedals. Cheers for following through on what must have been a bear of a manufacturing process. Always amazing to see what can be done with Carbon. Is there a reason the bike uses such a flat headtube? Reverse KAMM Tail, get with it. In all seriousness, this is pretty interesting for a number of reasons. First two that come to mind for me is that it allows the rider to run a light shallow-depth wheel for quicker acceleration and/or a wider tire with lower rolling resistance and more comfort. Of course, these factors are more important on the road rather than the track, but it still allows these options while still being as aero as possible (allegedly). I would think a steady crosswind on the road might make the rider curse this design. Ironman Kona 2017 and we should see someone riding the 180km on this. I can hear a crosswind calling. Mounted on your roof rack in a good crosswind, maybe your car will tip over like you’d just gotten a take out order of dino ribs a la Flintstones. This design employs the faulty concept of conventional wisdom for vehicle drag reduction. Fairing the wheel below the level of the axle actually substantially increases the effective drag on the vehicle, as disclosed in several of my already allowed pending patent applications, and in two patents already issued: US 9,567,016 and US 9,290,041. Vehicle drag testing in wind tunnels can also be improved by focusing instead on minimizing power dissipation as transferred through exposed wheels, rather than on laterally directed drag reduction, as disclosed in my now allowable pending patent application US 2105/0346051. I was going to say “Those patents sound similar to the nullwinds concept”, but now I see based on your link that you are the nullwinds guy. I understand that the portion of the wheel at 6’o clock is stationary, so it isn’t contributing to drag, but what about the spokes from 3-5 and 7-9 o’clock. Aren’t they experiencing some wind resistance, albeit at half the speed the spokes on top? Also, what about the value of shielding the lower trailing section of a wheel from the linear wind flow, in effect turning the lower part of the wheel into a single aerodynamic body, rather than a front half and back half? The proper vehicle system drag mechanics has gone unrecognized for decades, surprisingly, as taught by my patent applications, which have now been allowed by five different examiners. The problem is complex, since moments generated by drag on the wheel must be calculated about the stationary point of ground contact, rather than about the moving axle. Any drag on a slower lower wheel surface provides substantially less drag to the vehicle than drag on a vehicle frame surface. The lower wheel should NEVER be faired, since it resists vehicle motion far less than a frame surface. The opposite occurs above the axle, where wheel drag is greatly magnified over a vehicle frame surface. As a result, even Formula 1 and the truck trailer skirt industry have it backwards. Formula 1 increases drag on the front wheels with the low front deflector, while also reducing traction, and semi trailer skirts are far too extensive and low on the trailer. My patent disclosures greatly expand these concepts, should you be interested in fully understanding the mechanics of wheel drag on vehicles, which becomes critical in the presence of headwinds. Ever wonder why you are so punished against a headwind? It is the exposed upper portion of the wheel becoming more and more the principal source of power dissipated in drag on the vehicle as the headwind increases. One should also recognize that the vehicle drag coefficient that is so often sought and quoted is actually a variable – not a constant – which is dependent on vehicle operating conditions. Thanks for the interest. You had me till; ‘As a result, even Formula 1 and the truck trailer skirt industry have it backwards. Formula 1 increases drag on the front wheels with the low front deflector, while also reducing traction…..’ Yeah, those guys know nothing after 50years of development! Having a patent isn’t validation of concept. Alvis, I was thinking the same thing when F1 was mentioned. The F1 comparison is flawed. It is easy to see that F1 aerodynamics aren’t focused on drag reduction at all, they are focused on generating down force, which always generates drag. This why a vehicle with ~800hp is only capable of speeds in the 180’s. They aren’t really interested in going any faster. Only braking, cornering, and accelerating. I am going to hazard a guess that these drag theories in patent process only take the vehicle’s ground speed into account, and not the variable winds that exist in the outdoors. I didn’t know Formula 1’s front deflector was meant to reduce drag. I thought it was meant to increase down force, thus friction, thus traction. I didn’t know it results in reduced traction. Please let F1 know this before their race cars all slide out while cornering. I have two patents that are complete bullsh*t, related to the field of electrical engineering and control systems. Having a patent examiner sign off on something is not a validation of your principle, math or design. It is merely that your idea was unique, novel and properly filed. I can point to thousands of crazy patents both new and old of concepts that will never work. I haven’t read through your documents yet, so I just say this because citing that a patent examiner signed off on something is not any kind of validation. If you told me that this was published in an engineering journal like “Journal of Applied Mechanical Engineering” or “Journal of Wind Engineering & Industrial Aerodynamics” and peer reviewed, then not only would it hold more weight, but I would be able to read through comments by experts. Bikerumor.com if you keep putting sh*t like this on your sight, I’m going to hold you in contempt. It’s weird and wonderful: that’s why I come here. Two or three lucky Freds are going to lighten their wallets for these and that’s fine by me. Articles about 27.5+ hardtails and gravel bikes put me into a coma, these days. Looks like a perfect solution for the disk brake rotor guard problem! So why is the rear wheel a disc if it is fully faired? It wouldn’t need to be if only the rear cowling maintained an internal vacumn chamber. The same pump could be used to maintain/alter tire pressures. 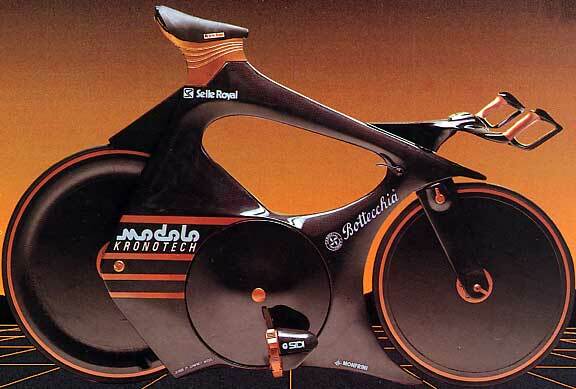 Looks like a modern version of the Bottecchia Kronos concept bike from the 80s. Let someone post something different and the haters flock. I love seeing wild concept cars and I enjoys a wild bike just as much. If someone has the commitment to get something like this build – I tip my hat and zoom in on the pics. I’m not any more likely to buy this than the 6-wheel corvette at the auto show – but I am glad I got to see it. I think it’s pretty cool. Would it work in real life? Dunno but it’s great to encourage innovation! You know, it REALLY looks like that scene when Neo hops off his track bike right as Agent Smith tries to take over his mind by copying himself, but just winds up taking the bike instead. (deleted)! Built for a Swiss client? Is Fabian Cancellera going to come out of retirement to take a shot at Wiggins’ hour record? Simple fact to get straight first.